Quinnipiac is heading down the closing stretch of the first half of the season with only two games remaining next weekend against Maine before winter break. Standing at 6-8-2 the first half of the season has not gone as expected for a team that was picked second in the league in the ECAC preseason poll. Too much inconsistent play has hurt the Bobcats through the first half coupled with a struggling offense that is only averaging 2.86 goals per game placing them in the bottom third of college hockey. For a team that was 8th one month ago in the pairwise rankings now sits at #42, a massive fall for a team with big expectations of returning to the NCAA tournament. They have time to figure it out but an at-large is looking like its going to be washed away unless they ran the table the rest of the way. Quinnipiac needs a sweep next weekend just to avoid being under .500 at the end of a 1st half of a season since the 2005-2006 campaign. With that said let's take a look at what some of the future Bobcats did over the past week. Wyatt Bongiovanni had a strong weekend for the Muskegon Lumberjacks with 2 goals and 1 assist. He now has goals in his last 3 games and 4 of his last 5. In his last 5 games played Bongiovanni has 7 points (4 goals, 3 assists). On the season he has 14 points (8 goals, 6 assists) in 18 games played. 3 of his 8 goals have come via the power play. William Fällström had one assist over the weekend for the Fargo Force in two games played. In 19 games played the Sweden native has 11 points (3 goals, 8 assists). Domenick Fensore had one assist in two games played over the weekend as the U-17 US Developmental team played Fargo and Youngstown in USHL play. In 9 USHL games played he has 2 assists. Justin Robbins had his best start of the season for the Chicago Steel. The New Jersey native made 35 saves giving up 2 goals in a 3-0 loss to the Des Moines Buccaneers. He has shown improvement in each of the four games he has played as he adjusts to the play of the USHL. Guus van Nes has been on fire since committing to Quinnipiac. 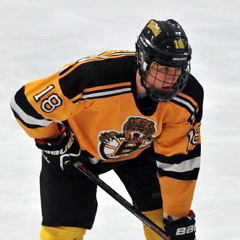 Over the weekend he had 5 points (2 goals, 3 assists) in 2 games played for the Junior Bruins. He is riding a 7 game point streak (5 goals, 10 assists) to take over the scoring lead in the NCDC. Daniel Winslow picked up a goal and an assist in two games played for the New Jersey Hitmen over the weekend. The Connecticut native in 20 games played has 19 points (7 goals, 12 assists). Matt Cassidy had two points over the past week in two games (1 goal, 1 assist). The New Jersey native has 16 points (7 goals, 9 assists) in 22 games played for the Brooks Bandits. Ethan de Jong of the Prince George Spruce Kings picked up one goal this past weekend. He only played in one game due to going to the WJAC Canada West evaluation camp. He's been well over a point per game player this year in the BCHL with 38 points (12 goals, 26 assists) in 30 games played. While he is committed for the 2019-2020 season and already signed his NLI it wouldn't shock me to see him accelerated to the 2018-2019 season depending on how Quinnipiac finishes this season and depending on if they can bring in additional talent for next season in order to hold de Jong back another season for development. Peter Diliberatore had two assists in two games played for the Salisbury School as they opened their season with two wins. Diliberatore is good puck mover and someone who has the ability to play the point and contribute offensively. Matt Fawcett returned from Sioux City in the USHL to play with Wincendon again this season. In the opening game for his team he scored the game winning goal in Saturday's game against St. Marks. He had 3 assists in 10 games for Sioux City before returning back east. Both Ethan Phillips and PJ Fletcher had good weekends for the South Kent Selects U-16 team. On Friday the team took part in a charity game with the #4 national ranked North Jersey Avalanche U-16 team. Combined the teams raised $80,000 for the American Cancer Society so great work for both programs doing good for people off the ice as well. Phillips had a goal and an assist Friday and his assist set up Fletcher for his goal. Both players played on Saturday against Skipjacks U-16 and Phillips had two goals while Fletcher had one assist. Victor Czerneckianair had a strong weekend for the South Kent U-15 team. Last weekend he had 34 points for the season now up to 38 points (18 goals, 20 assists) which puts him second on the team in goals and 3rd on the team in overall scoring. Jacob Quillan added 1 assist this past weekend in two games played for the Steele Subaru Major Midgets. On the season Quillan now has 25 points (8 goals, 17 assists) in 23 games played. Austin Spiridakis picked up another two points (1 goal, 1 assist) this past weekend for the St. Albert Tire Warehouse Raiders AAA team. In 19 games played, Spiridakis has 9 points (5 goals, 4 assists).